If you appreciate fine aesthetics, you'll notice that we've thought of everything. With chrome trims, piano black mirror shells, black roof rails and tinted side and rear windows, two-toned leather trims throughout the car, and complemented with a beautiful set of 19" Moab Alloy Wheels, the Touareg Monochrome exudes elegance from every angle. The Touareg is powerful enough to handle almost anything, with a braked towing capacity of 3500kg when fitted with a genuine Volkswagen tow bar. The power's in your hands, whether you're after more power or more interested in fuel economy, there's an engine for your Touareg. 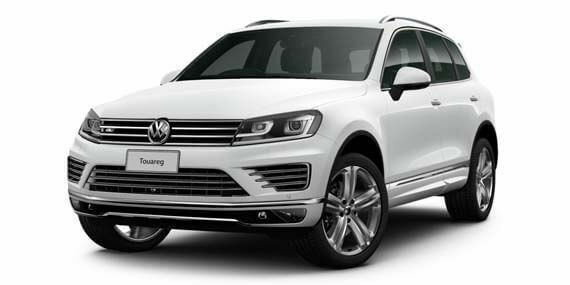 Don't let the Touareg's looks fool you. It's no triumph of style over substance. Beneath its stunning exterior lies a host of top of the line technologies all working to ensure every kilometre you drive is an absolute pleasure. A camera built-in to the boot of your car lets you spot any obstacles behind you quickly and easily, helping with reversing. The satellite navigation audio system, with 8" touchscreen, DVD drive, dual SD card slot, and premium multifunction display provide intuitively controlled and outstanding infotainment. Just because you have the power to take on the most rugged terrain, doesn't mean you have to compromise on comfort. Front seats feature 14-way electric adjustment including electro-pneumatic side bolsters, with Black Vienna leather appointed upholstery standard on the 150TDI and 150TDI Element and a choice of Corn Silk Beige or Black Nappa leather appointed upholstery for the V6 TDI. The V8TDI R-Line comes with special two-tone Flint Grey and Black Nappa leather appointed seat upholstery finished off with R-Line logo.